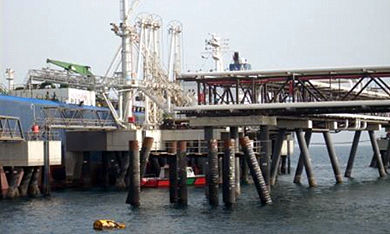 VHFL Phase V Offshore Expansion Project Vopak Oil Terminal, Fujairah (UAE). 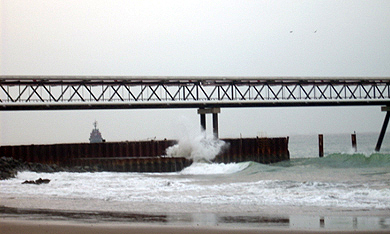 Construction of Berth 5 & 6 and Finger Pier connecting existing terminals. In November 2007, Antara Koh (I) Pte Ltd was contracted by Tidal Marine Engineering Sdn Bhd as the Specialist Piling Contractor to carry out offshore piling works for the Phase-V oil terminal expansion project of Vopak Horizon Fujairah Limited in UAE. The project calls for an addition of two Berths (Berth 5 & 6) to its existing four, which would increase the terminal’s capacity to handle two more tanker vessels up to 110,000 dwt and 60,000 dwt respectively. 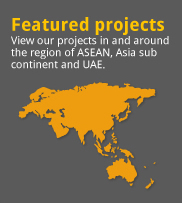 Our scope of works involved the installation of 224 nos of OD914mm x 19mm thick steel spiral pipe piles with lengths varying from 38m to 52m, and weights from 16tons to 23tons. 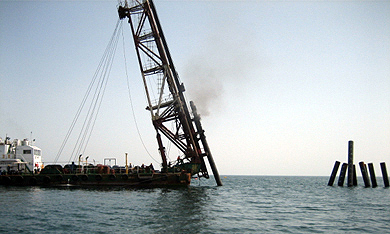 Vertical and raked piles up to 1:3 inclinations were installed in an average water depth of 16m, and to achieve penetration depth of 10m to 28m under sea bed. 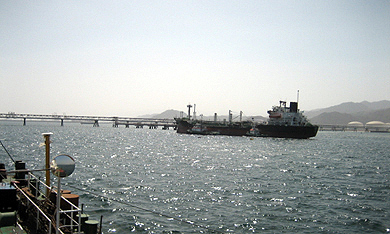 As an expansion pier, the project requires constructing structures in close proximity of the existing and operating oil terminal. Technical constraints such as space limitation, non-disturbance to terminal operation and a high level conformity of safety requirements need to be resolved. 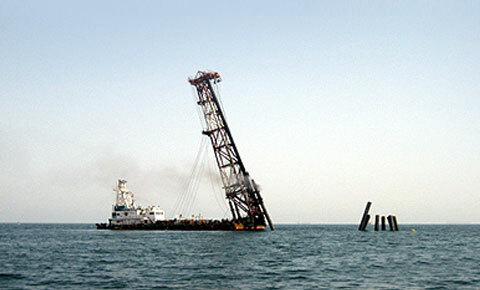 Other technical challenges faced include the unique environment of the Persian Gulf (open sea with swell up to 3m and sand storms bringing gusts measuring 25knots), narrow pile configuration and all angle pile orientations of dolphin structures. AK carried out the piling works via Direct Driving Method deploying the PB38 Piling Barge mounted with Delmag D100-13 Diesel Hammer and Pile Positioning GPS system. We managed the above-mentioned adversities through precise planning by our team of experienced staffs, and employing a fleet of heavy duty machinery operated by a team of well-trained offshore piling crews. Piles successfully installed adjacent to an operating oil terminal. Completed mooring dolphins and temporary platform conforms to strict safety requirements. 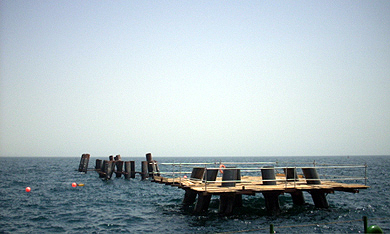 Rough open sea conditions of the Persian Gulf. 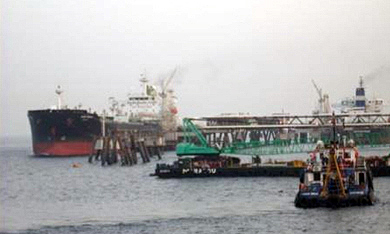 Marine plants and equipments working in close coordination with oil terminal operations and movements of heavy tankers. PB 38 Piling Barge driving raked pile in progress. PB38 piling barge working in close proximity to a ‘Live' oil loading/unloading facility. Crude vessels discharging their loads along side our working area.